How on earth can Sarri be happy with a 2-0 defeat? 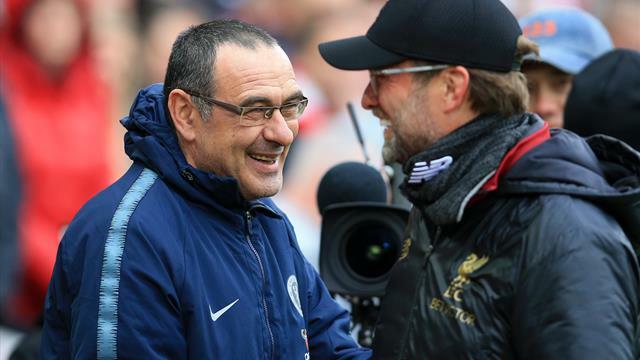 Maurizio Sarri says a mere 2-0 defeat at Anfield is an indicator that his side is improving. He won't find many Chelsea fans who agree with that, writes Dan Levene. For a Chelsea boss to be happy with a 2-0 defeat at Anfield is never a good look. But, in expressing his contentment with Chelsea's eighth defeat of this Premier League campaign, Sarri has revealed a level of ambition which does not meet that which fans of his club have come to expect. "I am really happy with the performance," he told a not especially large crowd of reporters on Merseyside. "Because we stayed in the match very well – probably three months ago we were not able to stay in this game, so we are improving." Three months ago, Chelsea were knocking Spurs out of the League Cup. And back in September Chelsea beat, then drew with Liverpool, in the space of three days. If anything, it is during the last three months that things have gone spectacularly wrong for Sarri's Chelsea. Perhaps what he meant was that losing 2-0 to one title contender beats losing 6-0 to the other? But, beyond all such semantics, lies the matter of ambition. With that statement, Sarri appeared to say that the priority at Anfield was damage limitation. Really, that should have been evident from his team selection, using Eden Hazard as substandard number nine. But you're not supposed to say it out loud. That calls to mind the nadir of last season, and Antonio Conte's successful attempt at scoring zero goals at the Etihad (one conceded). People expect such things of sides lower down the table, but not of Chelsea. By the end of that campaign, Chelsea had attained fifth under a manager who, for the majority of the season, was all but absent. Conte did not want to be there, didn't really seem to care who knew it and the word from inside the camp is that he barely made any impression to suggest he was doing anything but going through the motions. This season has been dominated by the dirge of a new playing style and yet the club still looks unlikely to improve on a status achieved while there was effectively nobody in charge. Fifth is probably the best they can hope for. Very little from Sarri's side has shown they are any better than the sixth best side in England, so there should be no surprise if that's where they finish. Depending on how Manchester United and Arsenal's games in hand fall, and on how bumpy they find the rest of the Road to Baku, the Blues could be reliant on Pep Guardiola lifting the FA Cup to avoid having to start their Europa League season in July. Most would not call that an improvement. And again, Sarri's lack of ambition is damaging to his reputation with fans here. Nobody expects this Chelsea side to storm the two-team league-within-a-league, featuring just City and Liverpool. But Chelsea should have been perfectly able to make it into the top four, and to fail to do so is a shortcoming which would generally cost the job of any boss. And here's Sarri's final problem. To admit this as a failing is to admit he doesn't have the ability needed for the job. And to fail to admit it as a failing is to admit he doesn't have the ambition needed for the job. Whatever the case, the only way Chelsea look likely to make any real improvement involves a Sarri-free scenario. And that, given what we've seen, shouldn't come as any big surprise come the season's end.